Now that I have my team of tanks, I've been staying off the quest trail (as planned) and found myself flying through whatever dungeon I encounter. I'll be writing about each one in the near future. For now, I want to focus on the changes coming in Patch 2.4, and how they'll effect my plans as I inch closer to the big 7-0. The problem with hitting 70 this late in the game, is that PvPers are already geared. Heck, we're coming up on the 4th Arena Season! This means that when I step into the BGs as 5 brand new level 70 Shaman, I'll likely be in level 90-100 Blues at best, while others are in level 146 Epics. Yikes. 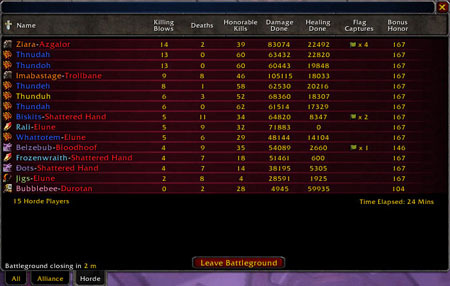 I'm going to miss this once I hit 70s BGs. The most painful part will be my lack of Resilience, a stat that reduces your chances to BE crit, and reduces the damage you take when you ARE crit. You have exactly zero resilience in your base stats, so the only way to build it up is to get resilience gear. That's easier said then done. Up till now, with the exception of a few raiding rings, you could only get resilience gear by pvping, but you need it to pvp competitively. So the only option for you is to run BGs, in terrible gear, and save your honor until you can afford to buy the gear you need. 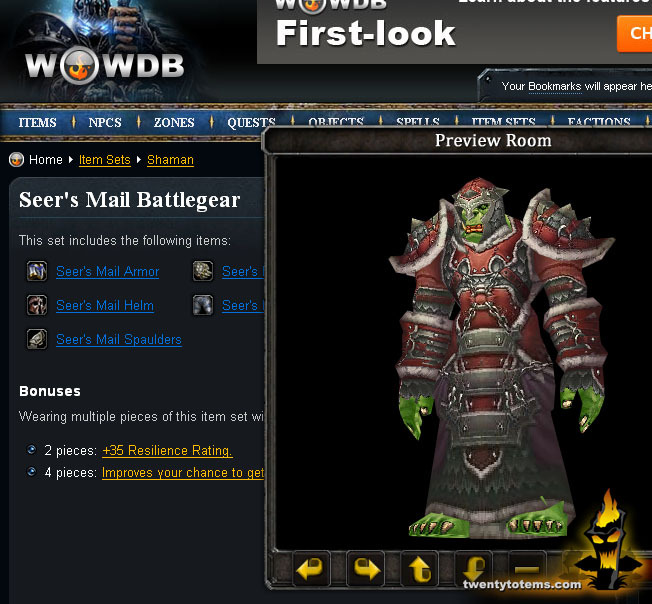 After Season 3 came out, the original Season 1 (S1) gear became available for bulk sums of honor. This is great! But when you add up the honor you need, you'll be stuck pugging through BGs for many months before you've got the gear you need to survive in Arenas. This is where 2.4 comes in. 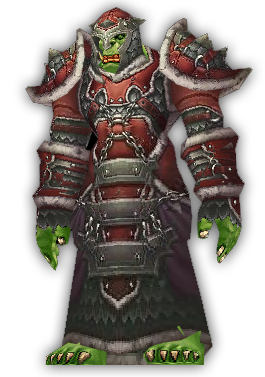 Blizzard recognized this gear gap, and decided to make available a set of Blue quality level 115 pvp gear, complete with resilience, and even a +35 resilence 2 piece set bonus. So how do you acquire this fabulous new wardrobe? PvE. In the expansion, Blizz decided to reward us with faction quartermasters. These are NPCs who offer you fabulous gear for rock bottom prices, based on the level of reputation you hold with their faction. So they're using these quartermasters to distribute the new pvp armor, an I couldn't be happier. WoWInsider posted a wonderful little spreadsheet pointing out what factions you need to get, in order to get the gear you want. They spread the gear out over five factions: Cenarion Circle, Thrallmar, Keepers of Time, Lower City and Sha'tar. As you can see from the chart, there are three types of Shaman gear. Elemental, Enhanced and Resto. Each is of course itemized around it's spec, and each one has it's own set bonuses. The Elemental set, which I'm obviously looking to, has a pretty stupid 4 piece bonus: 2% crit to shocks. This is frustrating because you're rarely in range to use shocks as an Elemental Shaman. What i'm more interested in, is the 2 set bonus that each set shares.... +35 resilience. Punch in your toon's name, your server and your region (US or EU) and BAM! The dishes are done! The page will build a beautiful bar chart showing exactly where your reputation is with all of the important TBC factions. But wait... it gets BETTER! When you click on each one, it actually shows you where and how you can build up your reputation, and even calculates how man mobs you need to kill, quests you need to finish or instances you need to run to reach the next reputation goal. WOOT! This makes it incredibly easy to keep track of my Reputation TO-DO list. I'm already well on my way to being Honored with all five factions long before the patch gets here. The patch also brings us a NEW faction to grind, the Shattered Sun Offensive which brings a pile of new dailies, server based progression and a pile of sweet new epics when you hit Exalted. I'll go over all of that, and my SSO plans in my next post. Shortly after that, I'll be sharing my experience in Sethekk Halls (oh man the first boss blows), my party with Thrall in the CoT, and even the Big Ding! It's all right around the corner. Stay tuned. I started a 5x shaman group recently and was wondering how you go about healing and dropping totems. So far when one of the five needs heals they all do the healing. I found this to be a great deal of over healing, but can't seem to find a solution. I would expect the blue armor sets to share the same set bonuses as the arena gear does. That is, mixing resto gear and elemental gear wouldn't give you both 2-set bonuses, just like mixing gladiator and vengeful/merciless doesn't. I *would* expect this logic to work however mixing gladiator gear with it, as mixing the high warlord and the gladiator gear does. For the healing, having a programmable keyboard like the G15 I use, and the Nostromo Keypad give you the option of creating a button that focuses healing from all 5 of your toons onto a specific one. When you do that, you can simply choose a lower level of Healing Wave. (or lesser) The heal will come quick, and when stacked by 5 toons it packs quite a punch. 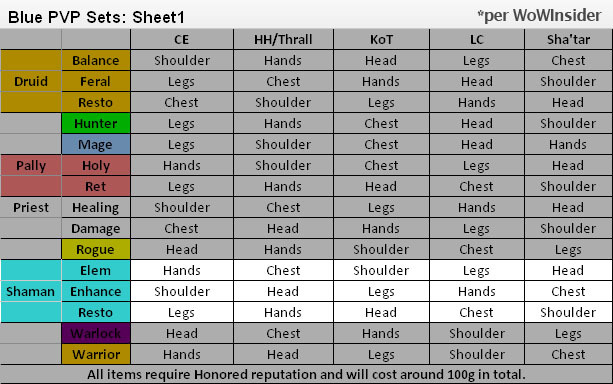 As for the set bonuses, I'm aware of the shared set bonuses found on the Arena gear. They way they did this was by using the same "Set Name" across all the Arena gear. For Elemental Shaman, it's called Gladiator's Thunderfist. A. Blizz overlooked it this time or B. They don't feel it will cause an imbalance at that level of gear. i haven't verified this with the 2.4 blue pvp gear, but as far as the set name thing goes, it doesn't matter. My druid has several pieces of S1 gear and a couple pieces of S3 gear, some resto, and some feral, all with different set names, and the bonus counts to all pieces. This is good because i can upgrade from S1 to S3 without losing the set bonus in the middle, but it won't let you stack the set bonuses. Blue, as it turns out, the Rep/PvP gear DOES stack 2piece bonuses when you use different sets. :) WOOT!